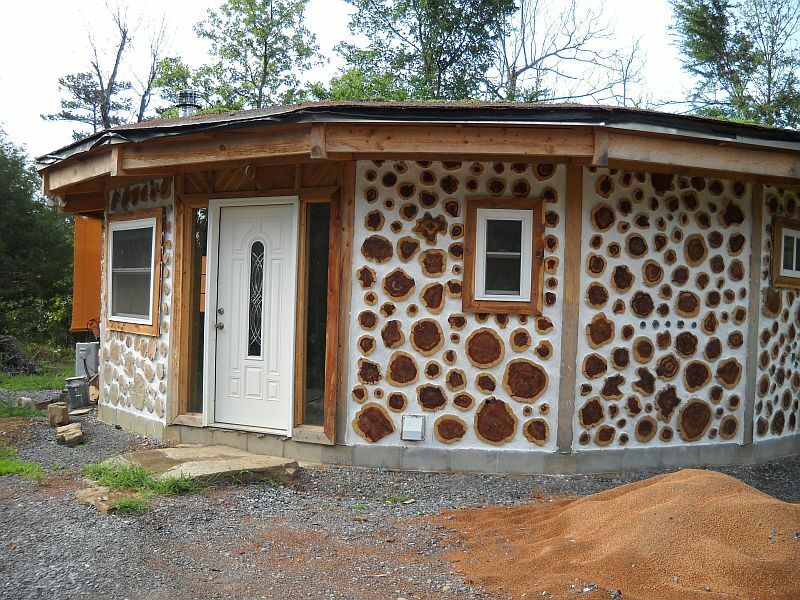 Alan & Rebecca’s 16 sided cordwood home made of 12″ eastern red cedar. At the edge of Ouchita Forest ten miles south of Wilburton, Ok, is a small community of homes in a serene and quiet treed area called the United Spanish War Veterans Colony. About 100 veterans and their families live here. A Hearthstone free standing stove takes care of all their heating requirements. Easter red cedar has beautiful patterning. 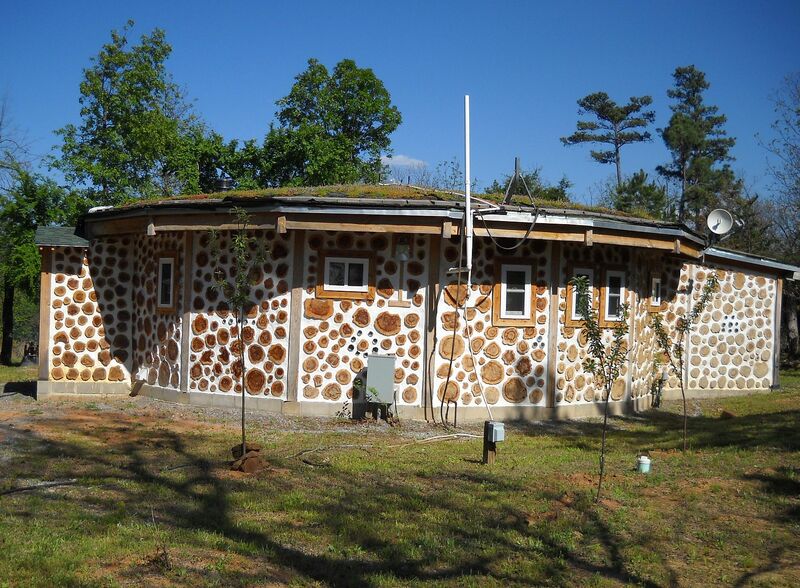 We acquired a three quarter acre lot here, and built a 16 sided cordwood home. It has an earth floor which has 8 coats of resin for hardening, and a living roof planted with sedum. The house is approximately 900 sq. ft., one bedroom 1 ½ bath. 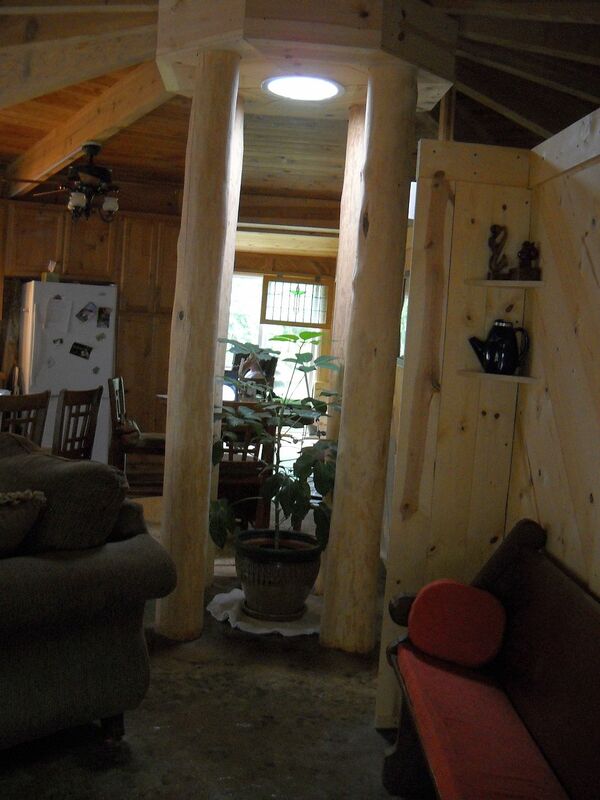 The ceiling is douglas fir and the structure is all locally milled pine. 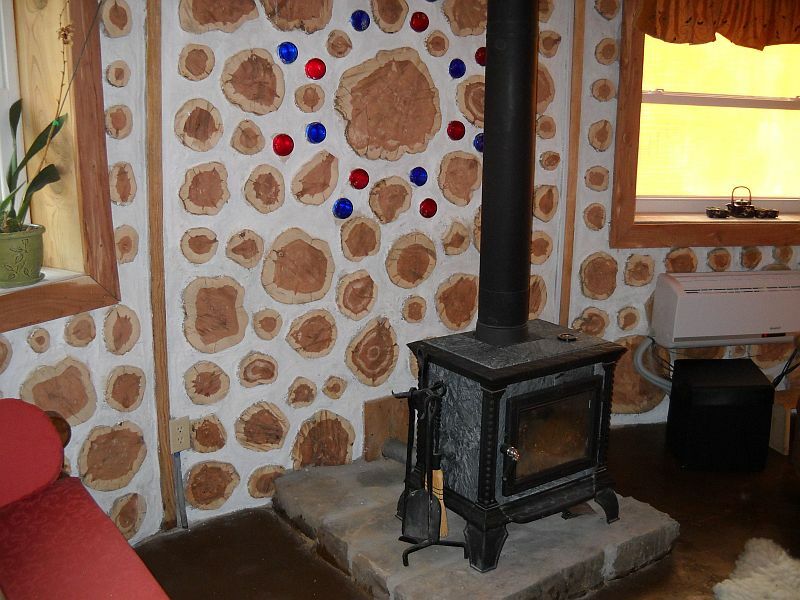 We used local cedar for our 12’ thick cordwood walls. The windows are low e and double hung. We added a sunroom on the south side for solar gain in the winter. It could be used as a second bedroom. We added a mud room on the north side where the main door is, for shoes and coats. The red cedar is a weed tree in the southern middle portion of the country and it is naturally resistant to insects. 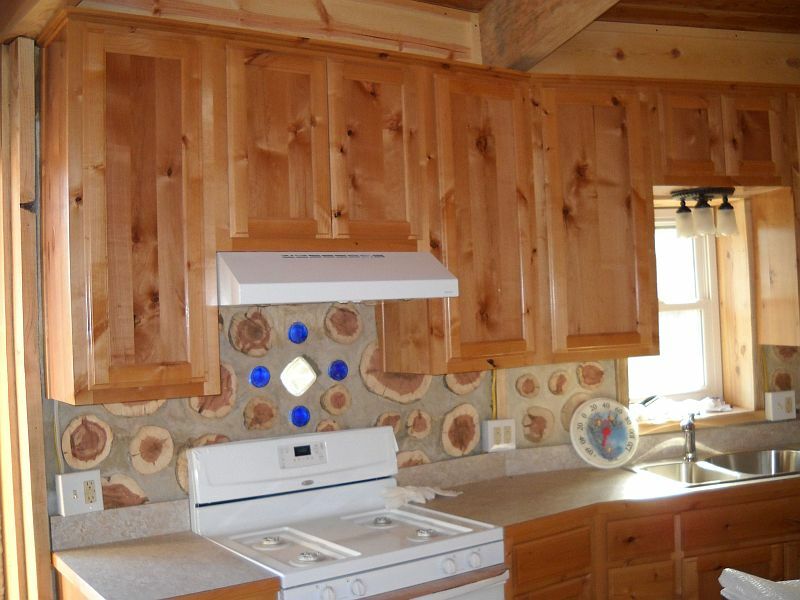 The kitchen and bathroom cabinets are knotty alder built custom for us by Quality Cabinets in Quinton, OK. The interior is all open with partial walls 7 feet high for the bath and bedroom. We have a soapstone wood stove that keeps us more than toasty in the winter. There is plenty of wood on the property to cut and split for years to come. We cool it with a heat pump. Our biggest electric bill in the summer has been $65.00. The county maintains the streets here and we pay no property taxes. We built a 10 by 12 deck on the east side of the house. Our water heater is propane on demand. You’ll never run out of hot water in the shower. There is a community hall here where a pot luck supper is held once a month for residents. Breakfast is served every Saturday morning at 9 AM. Holidays are celebrated at the hall also, with the colony providing the meat and each family bringing a dish to share. Each lot is a lifetime lease for each war veteran, and he or she only owns the improvements made on the property. Residents must be war veterans to buy a property in this community. Included in the sale is a 20 by 26 car port, two storage buildings, one cordwood, and one Rubbermaid. We have a half share in a fema approved storm shelter.